Edward George is a little bit lucky. The phrasing of the middle sentence exaggerates his importance a little bit, and “frequently in forward areas” means he was not very often in the line of fire. It is true, though, that Labour Corps men were used for replacement battalions, and often Labour Corps units were kept within the range of artillery for long periods. So we are not to downplay the danger, nor the effect that artillery, and the stench of death and disease would have on a twenty-year old fresh from the rural quietness of early Hemel Hempstead. 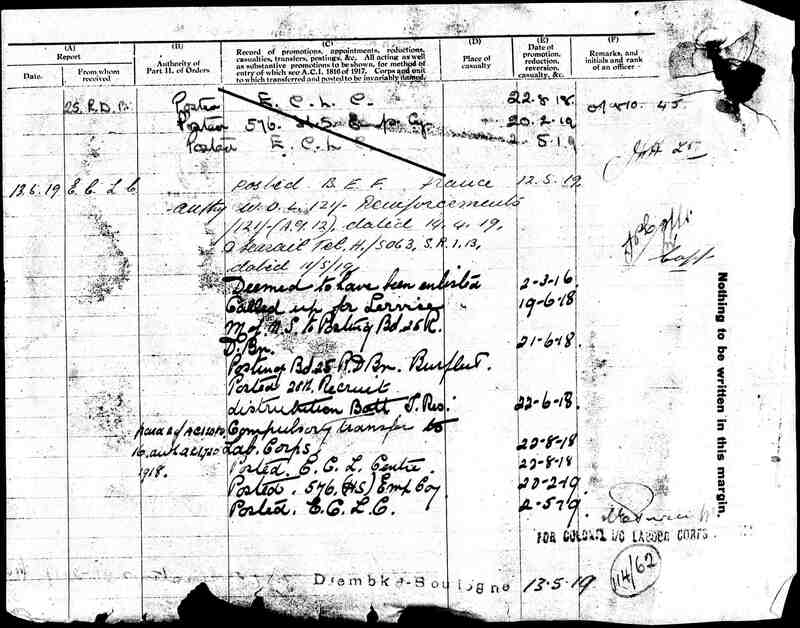 In the 1911 census he is living with his family in Watford, and although at 13 years old is still at school, he has an after-school job as an errand boy. At the outbreak of war, he was only 16 years old, so he would not be eligible to go to war until he was at least 18 years old. When he did so, his occupation was Cocoa Presser, he was 5feet 11in tall (which was tall for those times) and 20years 4months old, with a scar on his left knee; and he did not want to go into the navy. He enlisted on 2 March 1916, and he was called up on 19 June 1918. The war still had five months to rage, and a lot of men died in that time. On Armistice Day alone 11,000 soldiers perished, more than were killed on D-Day in WW2. In 1921, he married Nellie Elizabeth Boultwood in Watford and there would appear to be only one child from this marriage; Donald Edward Tearle 1922, born in Watford. Edward’s ancestry information are the same as for his father, Edward Joseph Tearle 1874 of Watford. 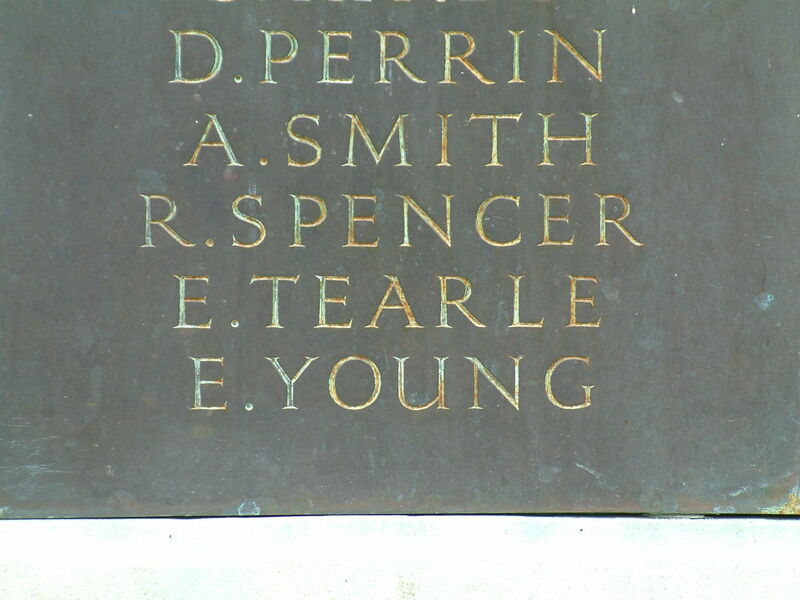 Elaine and I got quite a surprise, even a shock, to see the name E TEARLE on a WW2 memorial outside St Marys Church in the pretty little village of Old Welwyn. Welwyn Garden City is close to St Albans, and you can walk to Old Welwyn from Hatfield. It took us a while to gather the information needed to tell his story, but here it is now. The E Tearle honoured on WW2 section of the Old Welwyn memorial is Edward Kefford W Tearle, of the military police, b1907 in Essex. 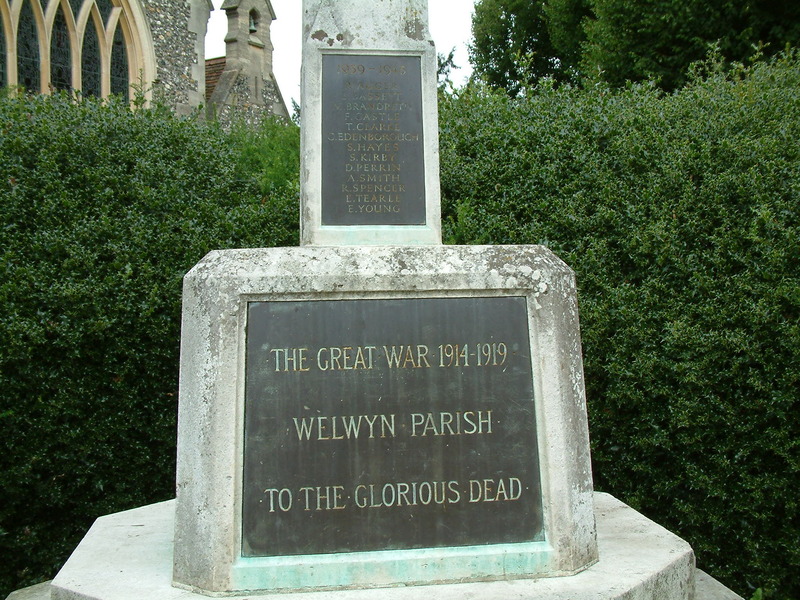 The memorial itself is next to St Marys, Old Welwyn. 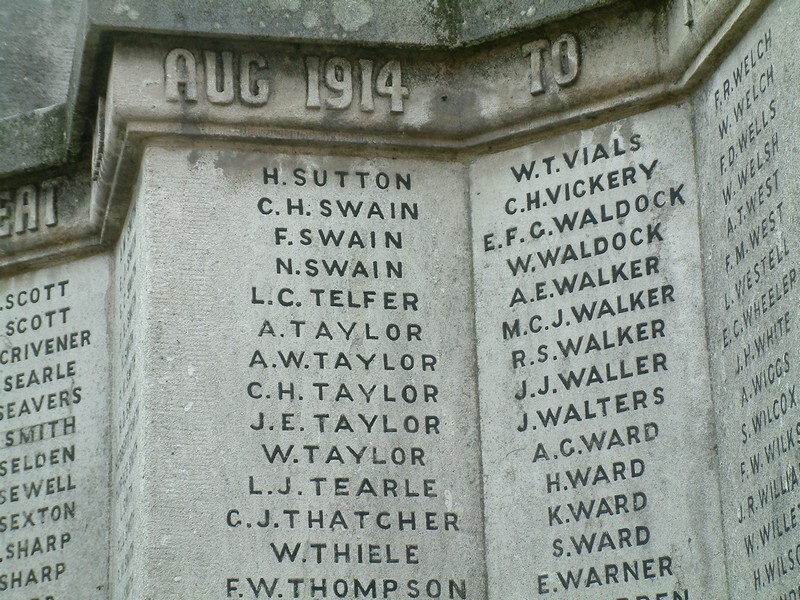 War memorial closeup, St Mary’s, Old Welwyn. Grave/Memorial Reference: Plot 2. Row C. Grave 26. This Edward Kefford W Tearle b1907 Lexden, Kent, was the son of Edward Kefford Tearle 1878 of Hatfield and Maud Sarah nee Micklefield, and as far as I know, he was their only son. He was the grandson of William 1857 of Soulbury and Sarah nee Kefford. He was the great-grandson of John 1831 Soulbury and Harriet nee Figg. Both these families are descended from Richard 1805 and Martha nee Walker, the parents of all the Soulbury Tearles. Leslie James T, John Henry T and Edward Kefford W Tearle are all descended from John Tearle 1830 and Harriet nee Figg, while Norman is descended from Richard 1843 (John’s brother) and Elizabeth nee Ellingham. All the Soulbury Tearle families are on the branch of John 1741. 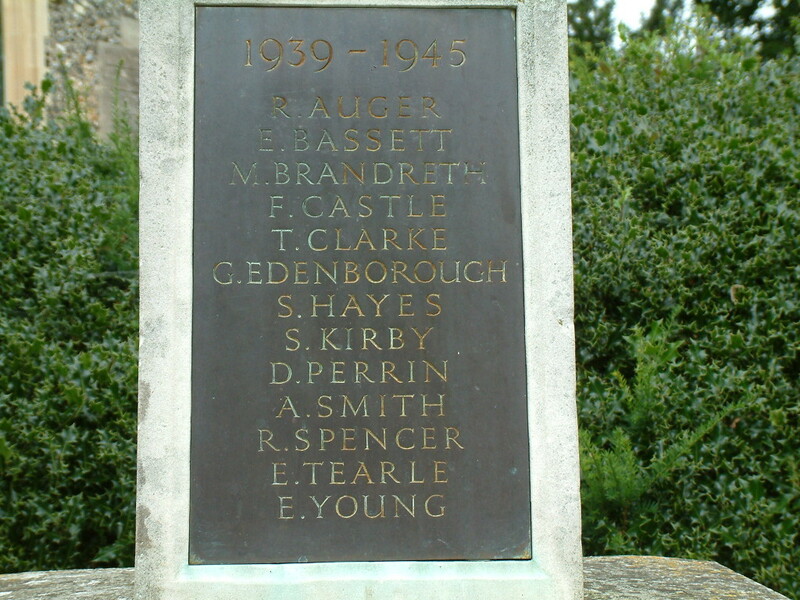 Detail of the WW2 names, Old Welwyn. Here are the results from our visit to the De Panne Communal Cemetery. 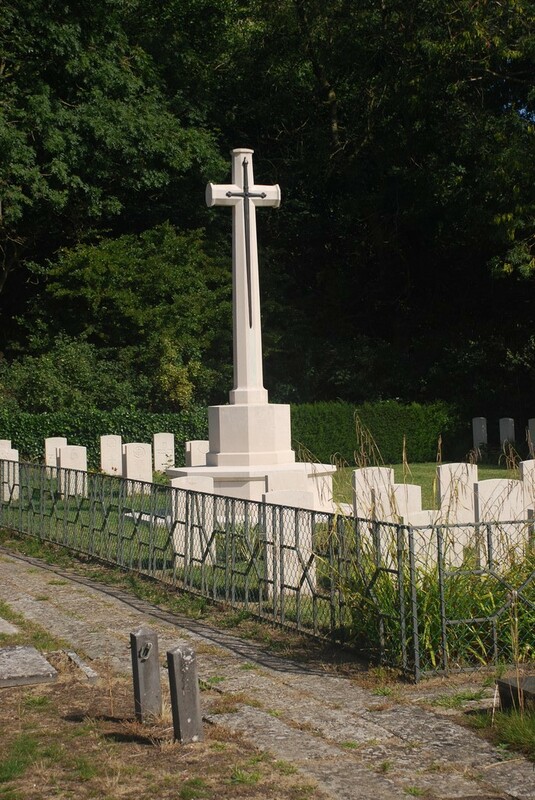 We took the bus from Ypres to De Panne and a tram trip from De Panne to the cemetery below. The Great Cross; De Panne Communal Cemetery. 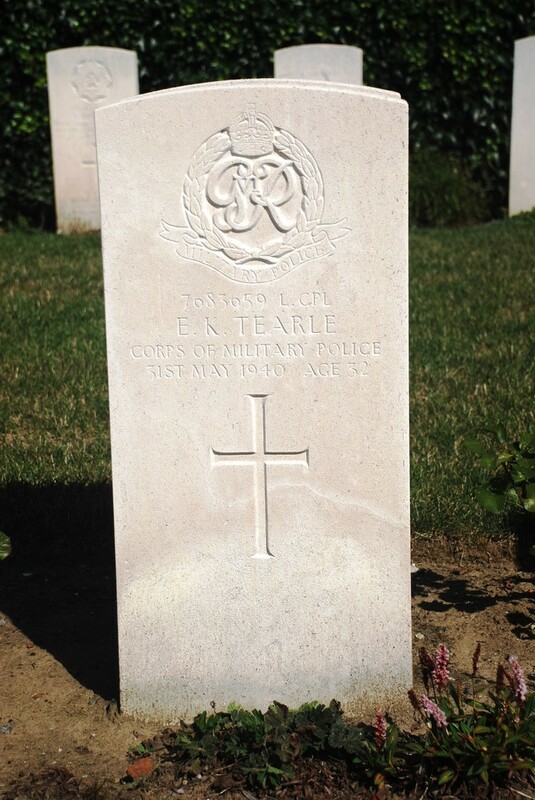 Edward Kefford William Tearle 7683659; De Panne Communal Cemetery. John Tearle and Harriett nee Figg were shockingly poor – they lived in cottages in Simonsyde (off the Coopers Green Lane to Stanborough) and they spent time in the Hatfield Union Workhouse. 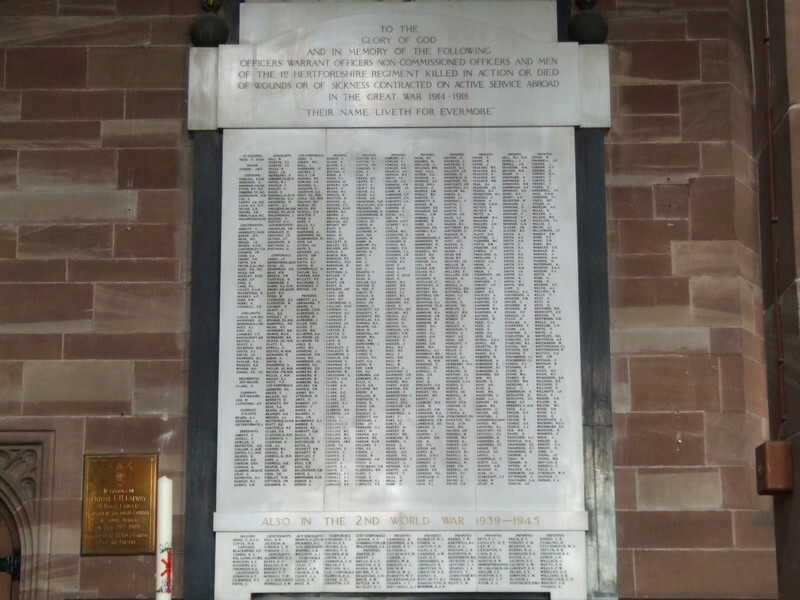 To compound their tragedies caused by poverty, John and Harriet’s grandsons were killed in WW1: Leslie James Tearle was killed in France and John Henry Tearle was killed in Gallipoli. Then, in WW2 this man, their g-grandson, was tragically killed defending the beaches of Dunkirk as the British and French armies made their escape, on the very same day that his second cousin, Norman Tearle, was killed trying to ferry men from the beaches to the waiting warships. 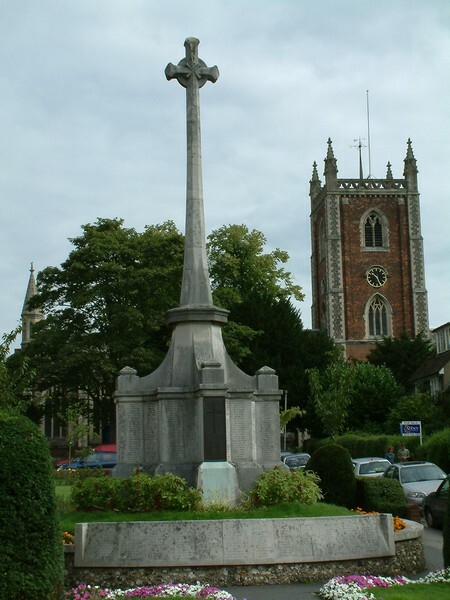 Norman went to war from Soulbury, while Edward’s family had left the village two generations earlier. We went to see Norman’s grave in Oostende, by tram, later on the same day that we visited De Panne. Edward Kefford W Tearle, above, died in May 1940, but his father, Edward Kefford Tearle (John Henry’s brother) died in September the same year. 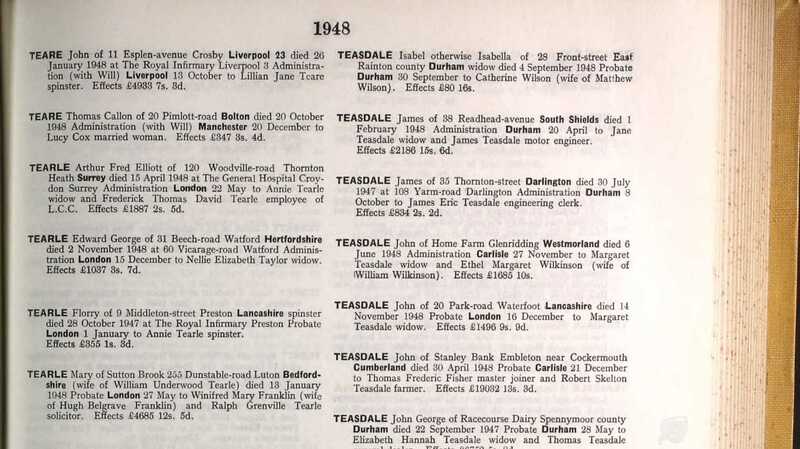 So poor Maud Sarah Tearle nee Micklefield lost both her son and her husband within six months. 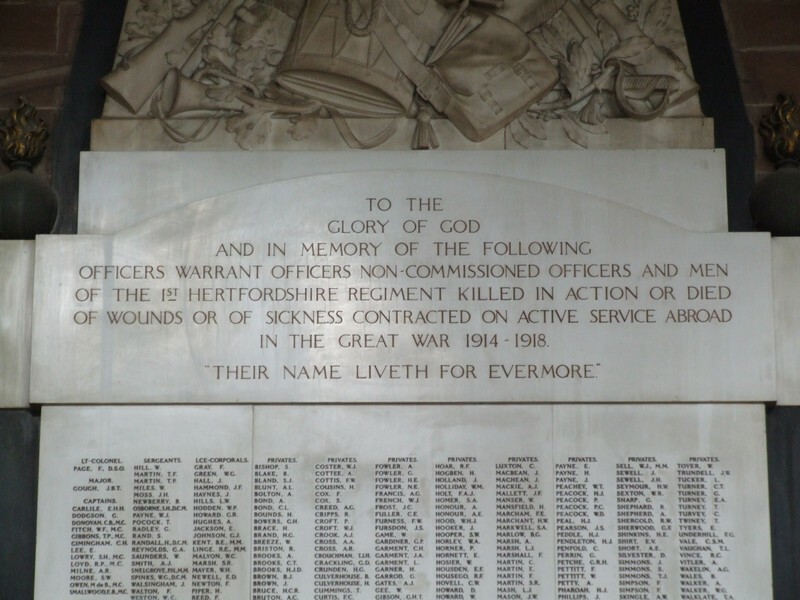 The War Memorial, St Albans. 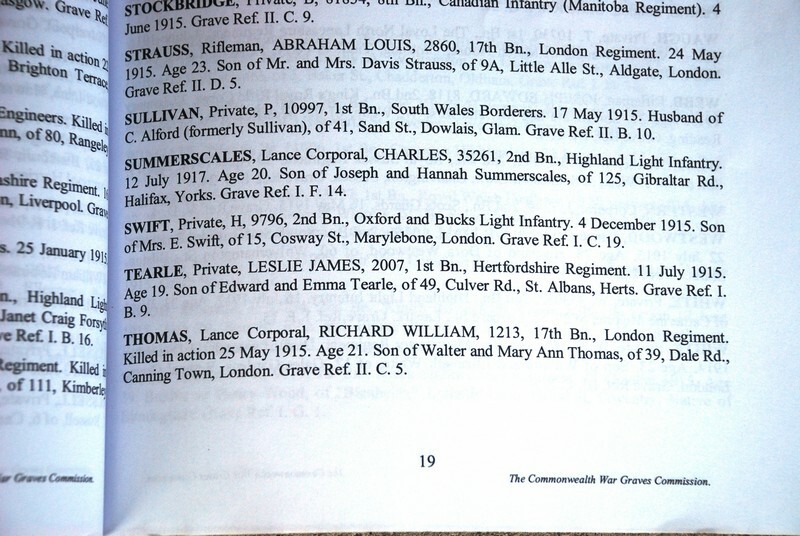 Additional information: Son of Edward and Emma Tearle, of 49, Culver Rd., St. Albans, Herts. Casualty Type: Commonwealth War Dead Grave/Memorial Reference: I. B. 9. His parents were Edward Joseph, b 1869, Simonshyde, Hatfield and Emma Warner b1872, Hatfield. Edward was the son of John b1831 Soulbury and Harriet nee Figg. John was the son of Richard 1805, Stanbridge and Martha nee Burnard. Richard was one of the many sons of Richard 1773, Stanbridge and Elizabeth nee Bodsworth – my ggggg-parents. And this Richard was the son of John 1741. Thus Leslie is of the branch John 1741. 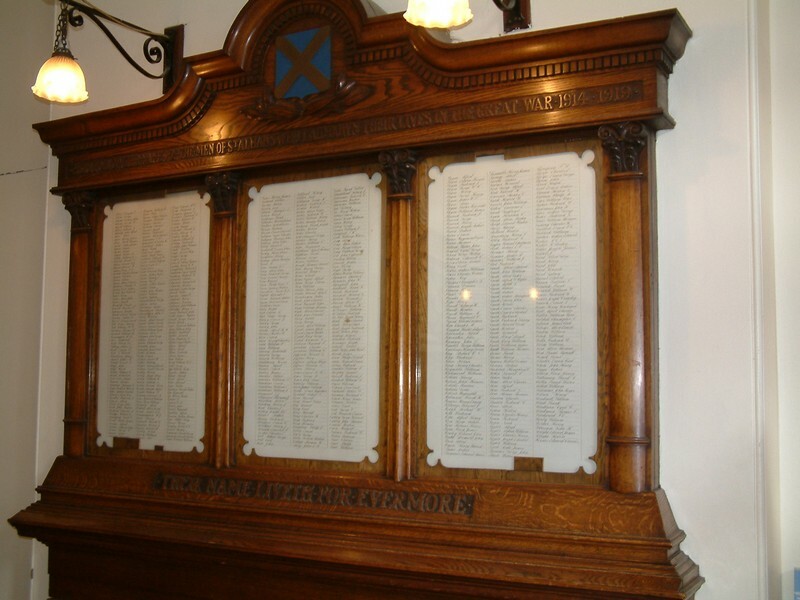 Leslie is remembered on the Honours Board in the Old Town Hall. Here is a closeup of Leslie’s name on the board. Leslie is also remembered on the Roll of Honour in All Saints Church, Hertford. Header section of the memorial. Leslie and Alfred Tearle on the War Memorial in All Saints, Hertford. 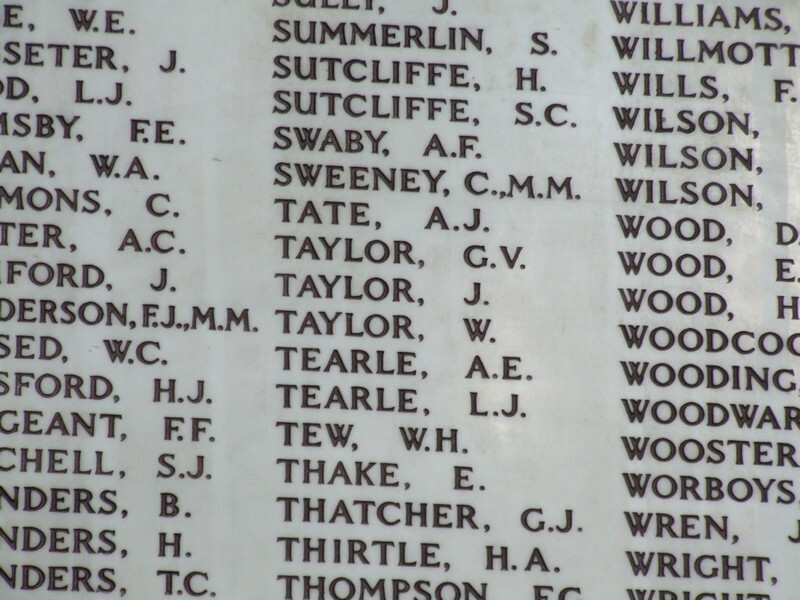 The first Tearle name on the list above in All Saints, Hertford is Alfred Edward Tearle 1897, of Watford. 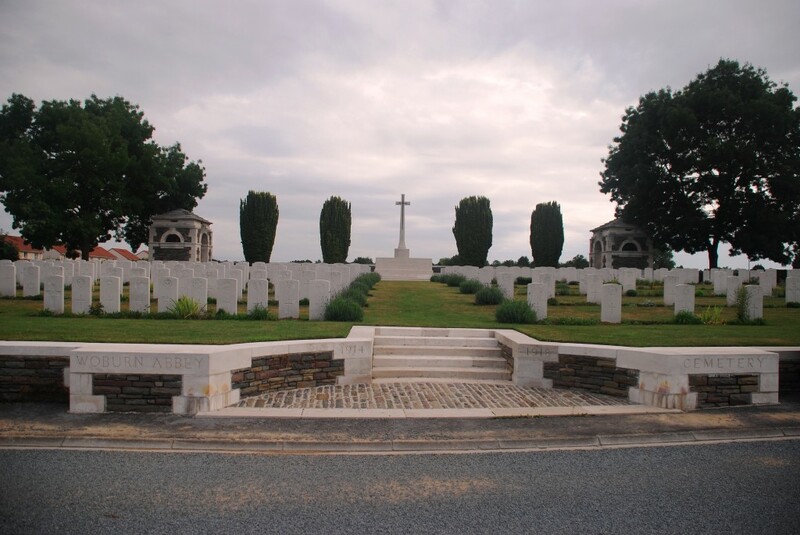 He is buried in Woburn Abbey Cemetery, Cuinchy, a village on a canal (with a lock) in Pas de Calais, with a four-hourly train connection. Below is the view from the road of Woburn Abbey Cemetery, Cuinchy. There was no one battle here; the area was always in range of German guns as was Woburn Abbey, the name given to a house nearby, which was used as a battalion headquarters and dressing station. 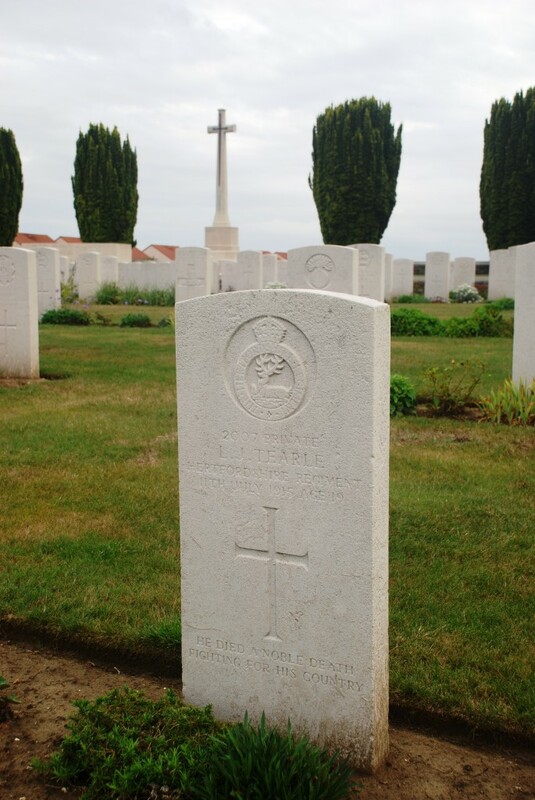 No details are given by CWGC about the circumstances in which young Leslie died. 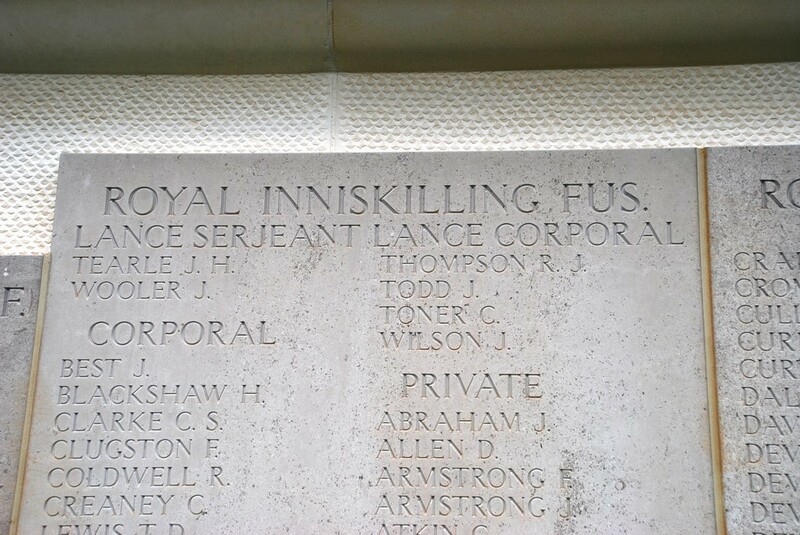 Leslie James Tearle in the Book of Remembrance; Woburn Abbey Cemetery, Cuinchy. 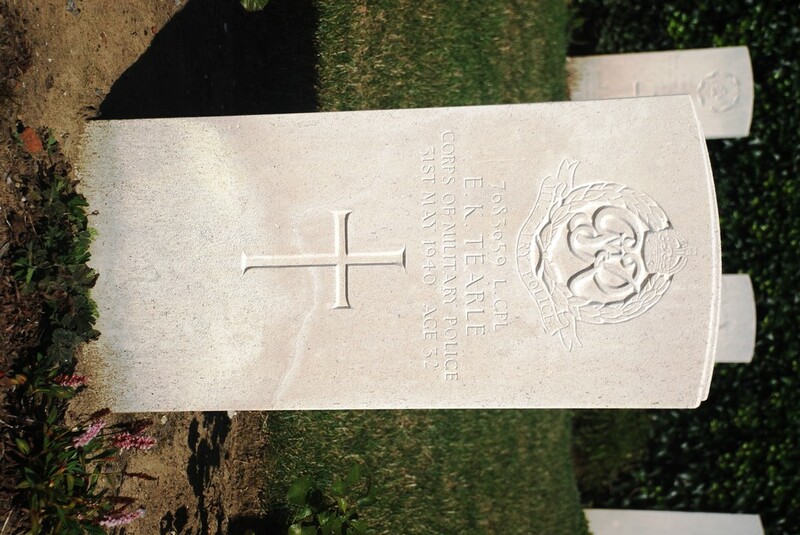 Leslie James Tearle headstone, Woburn Abbey Cemetery, Cuinchy. Additional information: Son of Mrs. Sarah Tearle, of 71, Port Hill, Bengeo, Hertford. Grave/Memorial Reference: Panel 97 to 101. There is no memorial in Hertfordshire for John Henry, but the “Helles Memorial for the English” gives John Henry full benefit for his sacrifice. 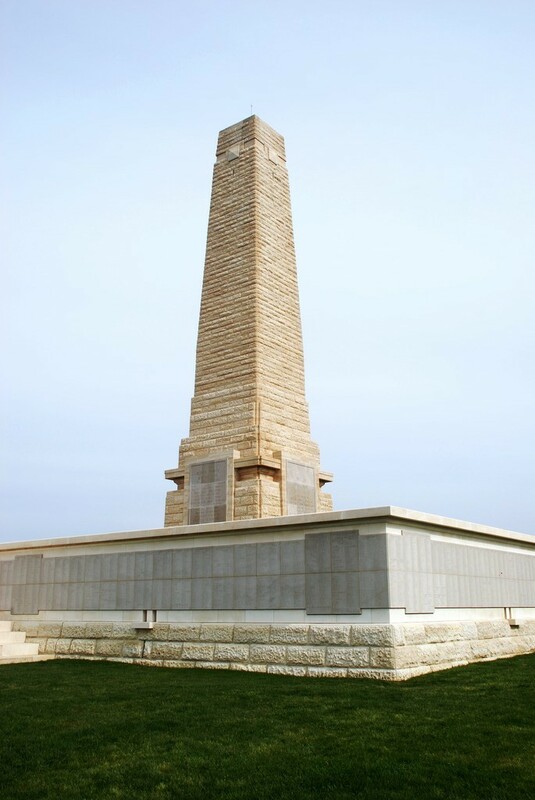 There is a section on John Henry Tearle in the article and booklet “A Visit to Gallipoli”. William’s parents were John 1831, Soulbury and Harriet nee Figg. 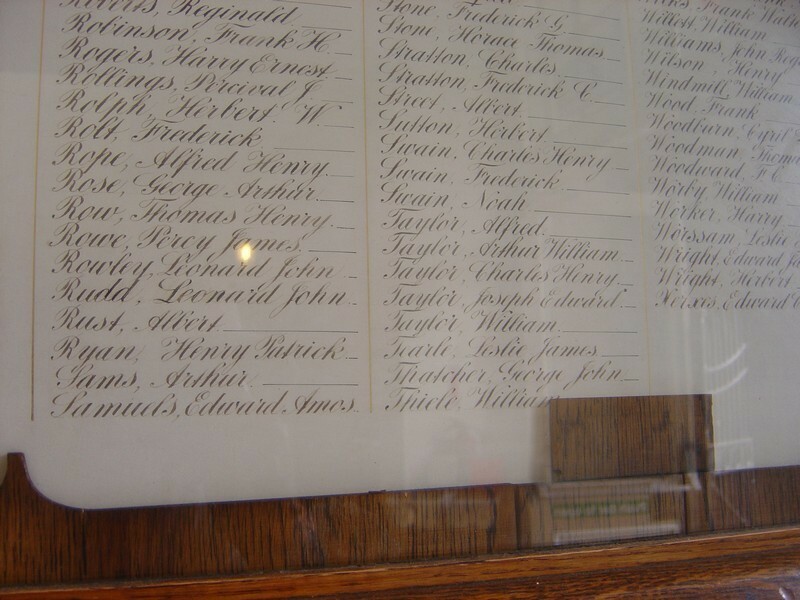 William and Edward Joseph, were brothers, so John Henry of Hatfield and Leslie James of St Albans were first cousins. Thus John Henry is also of the branch John 1741.